This interesting name is a variant of the more common name Bridges, which, contrary to appearances, has two possible origins, one the perhaps obvious English topographical or occupational one, and the other locational, from Belgium. 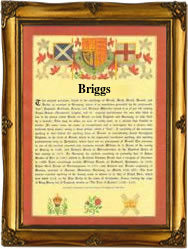 Firstly, then, the modern surname Bridges, Brydges or Briggs usually derives from the early medieval English topographical surname for someone who lived near a bridge, or from a metonymic occupational name for a bridge keeper; building and maintaining bridges was one of the three main feudal obligations in the Middle Ages, the others being the bearing of arms when required and the maintenance of fortifications. The derivation for this source is from the Middle English "brigge", from the Olde English pre 7th Century "brycg", bridge. The first recording of the surname from this source is that of Gilbert atte Brigge, in the 1272 Pipe Rolls of Surrey, and the "s" of the variant forms Bridges, Brydges and Briggs indicates the genitive case, meaning "of the bridge". Secondly, these surnames can be locational, from the Flemish city of Bruges, meaning "bridges", which had important trading links with England in the Middle Ages. The first recording, below, is from this source. An interesting namebearer was Henry Briggs (1561 - 1630), Professor of Astronomy, who published the early books of astral navigation. The first recorded spelling of the family name is shown to be that of William de Bruges, which was dated 1205, in the "Curia Regis Rolls of Oxfordshire", during the reign of King John, known as "Lackland", 1199 - 1216. Surnames became necessary when governments introduced personal taxation. In England this was known as Poll Tax. Throughout the centuries, surnames in every country have continued to "develop" often leading to astonishing variants of the original spelling.